12-page fully-illustrated Fiber Rush seat weaving how-to's. Get this booklet for fiber rush seat weaving in the pattern at left. Also has all instructions to adjust for chair seats that are not perfect squares. 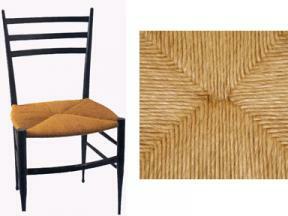 Click on chair image to see pattern weave. Get this booklet for fiber rush seatweaving. Also has all instructions to adjust for chair seats that are not perfect squares.